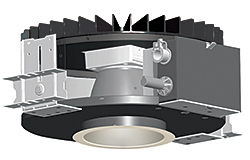 Indy LED architectural recessed lighting features a 34-watt light engine, producing nearly 1,800 lumens to approximate a 42-watt CFL. Modular design permits easy replacement of the light engine and driver should technology improvements become available. Features 3000K, 3500K and 4100K color temperature, 80 CRI and standard dimming.